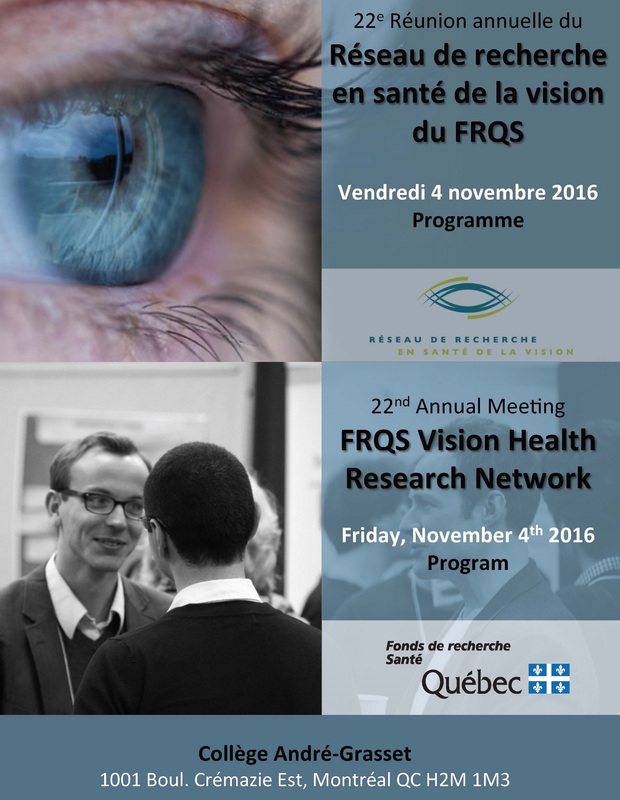 The 22nd VHRN Annual Meeting was held on Friday November 4th, 2016 at Collège André-Grasset in Montreal. The event gathered 252 students, researchers, clinicians and other professionals involved in vision health research. For the occasion, we invited a renowned keynote speaker, Dr Denis Pelli, who presented his work (biograpy below). The program also included 45 oral presentations and 83 posters. Congratulations to all the presenters for their excellent work! Denis Pelli is Professor of Psychology and Neural Science at New York University since 1995. He is also on the editorial board of the Journal of Vision and PLos ONE. He first studied applied mathematics at Harvard University, and then completed a PhD in physiology of vision at Cambridge University with Campbell and Robson. Current research in Pelli’s laboratory covers object and letter recognition, visual crowding, as well as the experience of beauty Denis Pelli won recognition of his peers with some major empirical fi ndings and useful theoretical accounts in the vision research fi eld. He also conceived numerous tools, such as the Psychtoolbox, the QUEST algorithm or the Pelli-Robson Contrast Sensitivity Chart, that are widely used in clinic and in research today Along his career, Dr Pelli published several articles, including publications in prestigious journals such as Nature or Science Its remarkable contributions to the visual science have combined to provide much of the support for the modern understanding of object recognition. He is the recipient of the leadership Award/New Focus Prize, which is granted each year by the Optical Society of America. His lecture focused on the use of psychophysics and machine learning to understand object detection and recognition. who ensured the smooth running of the event!